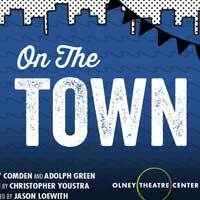 As World War II rages overseas, three sailors on leave have 24 hours to spend in New York City in the classic musical On the Town, coming to the Olney Theatre Center's Mainstage. Featuring a score by Leonard Bernstein that includes the standard "New York, New York," this delightful romp follows Ozzie, Chip and Gabey as they meet up with three lively ladies for an adventure through the City That Never Sleeps. Frank Sinatra and Gene Kelly later made a film version, but there's nothing like catching a Broadway favorite on stage. "...Some of the numbers on this erratic evening are quite pleasing, and none more than Bernstein's achingly lovely "Some Other Time," sung with a chanteuse's grace of execution by Zampelli, backed by Olivera, Casey and Ludwig. It's plaintive and unadorned and an antidote to the preceding mayhem, not all of which is polished to the necessary brilliance. Ah well, some other time." "...Director Jason Loewith has assembled a to-die-for cast for Olney’s snappy On the Town. And the buck stops with that onstage ensemble, including the orchestra, since the production is staged and paced pretty much like a revue of the show’s fabulous, often hilarious, songs." "...To mark the centennial year of the birth of both Leonard Bernstein and Jerome Robbins, Olney Theatre Center in the Maryland suburbs of Washington, D.C., has staged a sumptuous production of the two legends' first work for Broadway, On the Town. Director Jason Loewith, also Olney's artistic director, and his insanely skilled cast bring the audience into the world of three World War II sailors on a 24-hour shore leave in New York City." "...D.C.-area audiences are notorious for their too-free-and-easy awarding of standing ovations. But last night's prolonged, enthusiastic, standing, whooping, hollering, response to Olney Theatre's presentation of On the Town was as fully deserved as it could be. Every aspect of the exuberant 1944 Leonard Bernstein/Jerome Robbins/Adolph Comden/Betty Green collaboration was performed at a level of near-perfection." "...The dancing in the Olney Theatre production of “On The Town” is a delicious gift from the heavens. The voices are a wonderful gift as well, and hearing so many DMV theatre favorites in one show is a rare treat, but the dancing is just the final touch that elevates this show as the theatre season winds down. Tara Jeanne Vallee choreographed this production and the dancing is so good it nearly deserves to be named as a role in the cast bios." "...There’s nothing like live music to make a show snap, and it’s a full sound you get from Olney’s 14 piece onstage orchestra. Music Director Christopher Youstra, has enormous fun slipping in little asides to New York- the honk of a taxi, the ‘rimshot’ of a joke well placed. Indeed, director Jason Loewith breaks not only the third wall, but the fourth wall too, making Youstra, whose orchestra is set against the back wall, a well-timed part of the action on occasions."